I haven't done a sports column in a long time, and I am seeing a pattern emerge with the Buffalo Sabres that inspired me to write about sports today. There have been rumors about the Sabres trading Evander Kane since last season, and now the media is speculating that every player on the roster except for Jack Eichel is up for grabs. It seems to me that the Sabres in general, no matter who the general manager may be, have no idea how to actually build a winning hockey team. Any sports team revolves around its core talent and its leaders. A leader is not necessarily the most talented player on the team. A leader can be someone who works extremely hard and puts it all on the line every game for his team. A locker room develops its leaders over time, and a team creates its chemistry over time. The Buffalo Sabres have been stripped down to almost nothing three times in the last five or six years. How can any team expect to grow into a winner when it is never given a chance to develop? There is something truly wrong with the team we have right now. Our team has enough talent to avoid the league basement, yet that is exactly where it is. Is it our goaltending? While neither of the goalies we have right now are legitimate NHL starters, there are only so many games a team can win when it is scoring no goals or only one. No matter what your thought is on the goalie situation, the goalies are not supposed to score goals. Maybe our coaching is substandard? Phil Housley has never been an NHL head coach before and his inexperience is showing. The team looks listless and disinterested in just about every game. Jack Eichel skates around during his shift like he is not even there, and our defense continues to make embarrassing errors all over the ice. But shouldn't these highly paid professionals be able to at least make the effort each night to try and win? When I read Facebook comments after each loss, the lack of effort is one of the most common observations fans make. The coach cannot play the game for his team; the team has to make the effort to win the game. That effort is lacking. I think this team is the direct result of constantly trying to do rapid rebuilds by trading away quality players for draft picks that have lately amounted to nothing. Even when we bring in experienced players, they seem to fall into that dull malaise that is affecting the rest of the team. What we have here in Buffalo is a losing culture, and you develop a strong losing culture by constantly bringing players in and out of the organization with no real plan. There is only so many times you can strip the team down to six or seven players and try to build it back up before the team goes flat. Evander Kane is only 26 years old. Why is there talk of trading him instead of trying to resign him? Would he be too expensive? If you want to win, you have to pay the price. Why not a core of Eichel and Kane and build out from there? I keep hearing that Ullmark is not ready yet. At this point, what is the harm in bringing him up to help finish out the season and finally put Robin Lehner out of our misery? A team cannot constantly get rid of its best talent for draft picks and "prospects" and hope to build a winning team. We need to be better in the draft, and we need to be more active in free agency. But what we cannot continue to do is trade away talent for draft picks that usually amount to nothing. Even if we manage to make a trade for a draft pick that turns into a good player, the fans in Buffalo won't see that player for years. Jack Eichel was a significant exception to how draft picks usually work. It is time that the Sabres management stop giving away our future in the hopes of receiving something in return. Jason Botterill set the standard when he paid Jack Eichel $10 million per year starting next year. Now he has to live with that standard and be prepared to pay for quality players to help build a winner. Edmonton spent years having the first overall draft pick and those fans are still waiting for a good team. Last year's team made the playoffs, but this year's Oilers are struggling. This insanity has to stop. We have talent in Rochester that is ready to play at this level. It is time to stop wasting everyone's time and start letting that talent play. We have a couple of players (Kane and O'Reilly) worth paying decent money to stay here. Instead of trading them off for draft picks or prospects, we should keep those players here and deal with the salary standards we have set. You cannot build a winning team the way the Sabres are trying to do it. You cannot keep shipping off your talent in hopes of a brighter future because that brighter future will never come. We need to keep our stronger players on the roster, bring up the talent that has been developing in Rochester, and make better moves in the draft and free agency. If we keep giving away our talent every two years, we will be stuck in this never-ending cycle of embarrassment. 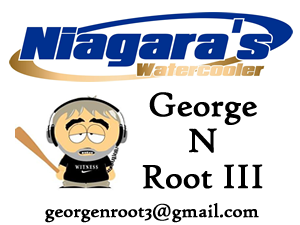 George N Root III is a hockey fan and big time Sabres fan. Follow him on Twitter @georgenroot3, or send him a message at georgenroot3@gmail.com.